The Exhibition opening was a great success with over 100 guests on a wet wednesday evening (November 3rd) at the Central Library in Hull, and ran for 2 weeks the exhibition has now moved to The Open Doors Project at Princes Avenue Methodist Church. The digital artworks, photographic portraits, audio and text will be stored online on this website and at the Untold Stories Archive.Untold Stories is part of Roots and Wings, a Creative People and Places Project funded by Arts Council England, and the James Reckitt Library Trust. Raising the profile of the Library Service and the wider cultural offer of Hull. 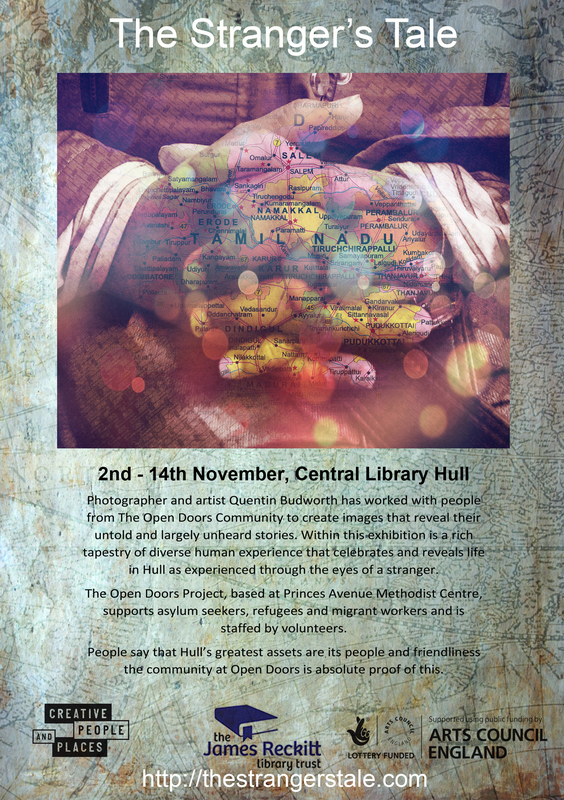 The Exhibition then travelled to The Open Doors Project at Prince’s Avenue Methodist Church in Hull. Where it will be shown for two weeks until December the 1st. Responses to the work from within the community. Many of the refugees there have very limited English but one word that kept coming up in conversation was ‘beautiful’. Space is limited at Open Doors so the full exhibition was impractical to hang in the space. I did however manage to get most of the stories onto some partitions.